For those quieter "bedroom" sessions, these highly rated cheap guitar practice amps pack more than enough power. It's generally agreed that solid state practice amps fall within the 10-20 watt range, although many serious guitarists do practice on larger combos and even stacks (not so great for apartment dwellers!). While it would be easy for us to pick only those cheap amps which simply "do the job", we've instead looked more at specifics such as tone (e.g. for quality home recording) and onboard features (e.g. amp modelling, line inputs/outputs etc.). Basically, small amps with big sound and features. Best for Guitarists who want traditional, tube-like tones with basic setup. Guitarists who want a modern, metal-ready amp with basic setup. Guitarists who want some onboard effects & more choice & control over their tone. Guitarists who want a rich array of onboard effects & detailed control over their tone. Defining Features Basic operation. Vintage tone. Headphones socket. Basic operation. Powerful gain. 3 band EQ. Headphones and aux-in sockets. 4 amp models. 7 effects. Headphones & aux-in sockets. 24 preset effects. 17 preset amp models. Tuner. Software to create & edit sounds. USB connectivity. Footswitch Input. Add. Controls Gain. Volume. Channel Select. Clean Volume. Overdrive Volume. Gain. Channel Select. Gain. Volume. Voice Select. FX Level. FX Select. Tap Switch. Gain. Volume. Master. Preset Select. Modify. Delay/Reverb. Tap Switch (hold for tuner). 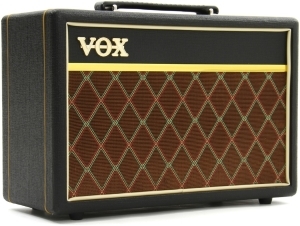 Vox are known for their rich, vibrant cleans and classy, vintage distorted tones, often described as a distinctly "British sound". If you're just after basic, no-nonsense features, with enough power for the home or small studio, the Pathfinder 10, at just under $80, is a solid choice. Very basic, albeit adequate setup - 2 channels, 2 band EQ (bass, treble) and gain control. You also get a headphone/line out socket for that late night noodling and recording. If aesthetics mean anything to you, the Vox Pathfinder certainly stands out from the crowd. Elegantly oblong with its trademark criss-crossed cloth speaker cover. One strum of an open chord and you instantly get those classic Vox cleans - warm, jangly and crystal clear. Some have mentioned it's a tad treble-heavy, but not to its detriment. Tease up the gain and you get some uncanny tube-like tones, although metal-heads will be disappointed at just how far the gain knob will take you. The dirtiest you'll get is some extra punch and crunch. It will handle more subtle lead lines, but your solos won't soar like they would with the modelling amps on this page. However, what it lacks in gain it makes up for with its chiming, articulate cleans. Saying that, it does handle those more reserved sounds very naturally and gracefully and, typical of Vox solid states, it does have "that tube vibe" which is what many buy it for. It's also surprisingly loud for a 10 watter, although obviously don't expect it to cut through the drums at a gig. Similar to the Vox in terms of minimalistic design and simple operation, but delivering an overall more modern sound with a beefier dirty channel. Cleans are warm and punchy with the 8 inch speaker and rugged cabinet providing excellent bass response. A separate volume for the clean and overdrive channel is a nice additional feature. Pushing the gain will take you right into metal territory. 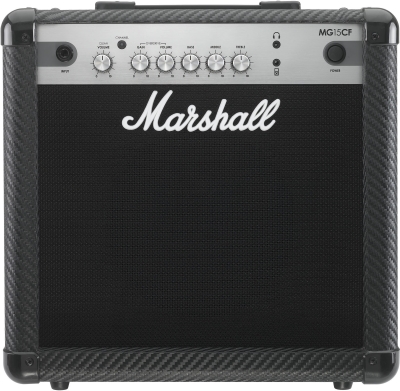 Surprisingly loud and full, the 15 watt CF doesn't muddy or fizz up like many low wattage amps and gives you that famously big, gutsy, yet smooth Marshall tone even at bedroom volumes. With a 3 band EQ (bass, middle, treble), there's a healthy range of sounds with which to experiment. The bass is especially generous when pushed and will easily shake the floor boards. But if you want to keep the neighbours sweet, there's a headphone socket that also doubles as a line-out for recording on your computer/device. Plus, there's an input socket for connecting your audio device if you want to play along to a track. 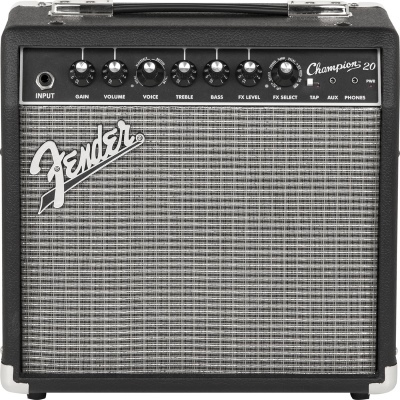 The first of two Fender amps featured on this page. The Champion introduces onboard effects and amp modelling to those guitarists who seek a little more tonal experimentation in their practice sessions, without sacrificing operational simplicity, with only two knobs controlling the voice (amp model) and effects selection respectively. 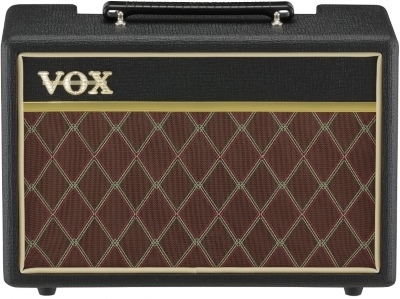 With 4 Fender amp models (Tweed, Blackface, British and Metal) and 7 effects (including chorus, delay and wah), there's a much broader range of sounds to be dialled in than the Marshall and Vox. If your stylistic palette is broad, the Champion will satisfy everything from your classic rock/blues to modern, super over-driven metal needs. But even if you just want those brilliantly bright, chiming Fender cleans in a portable combo that's loud enough for small venues, the Champion is cheap enough that you won't feel you have to even touch the effects controls to get your money's worth. 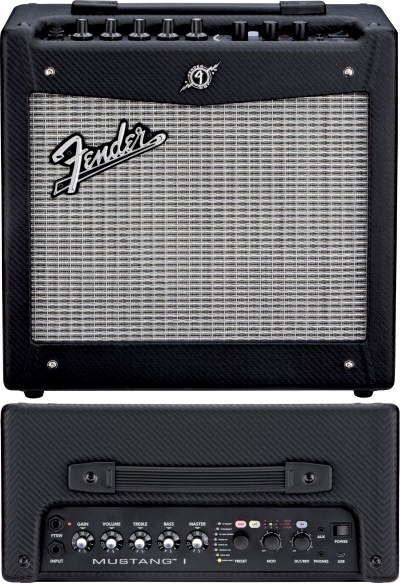 In short, simple enough to make a truly unique statement with a couple of twists, yet confident enough to scale back and just let it do what Fender amps do best. You have to hand it to Fender. They've recently unveiled a series of excellent value, feature rich amps that destroy pretty much all others in their price range. If you're looking for no-holds-barred amp modelling with USB connectivity, footswitchable channels, an onboard tuner and software for high quality home recording, learn more about the Mustang I. There's so much to talk about. This is an incredibly versatile practice amp and there's a lot to play with, not only on the amp itself but, if you're so inclined, on your computer via the FUSE software, which opens up a whole universe of tone modification. So be warned, this is not a K.I.S.S. amp, and I know there are those of us who prefer not to be tempted into hours of tone experimentation. It's the proverbial kid in the candy store scenario. You don't have to use the software though. Onboard are 24 preset effects including chorus, flanger, tremolo, phaser and a range of delay and reverb effects. Also onboard are 24 amp modelling options from jangly, vintage cleans to ultra-distorted metal. So the Mustang is like the Champion on steroids. The FUSE software allows you to edit and essentially create your own presets and swap them with community members, giving you a mammoth library of tones. This makes the Mustang great for varied songwriting and home recording - you'll always be able to dial in the sound you need, no matter what genre or style. It's a clichéd phrase, but the possibilities really are endless, no longer limited merely to the preset circuitry in the amp. 20 watts gives you slightly more power than most guitar practice amps. It's loud, deep (thanks partly to the closed back) and will even do you proud at small gigs if you mic up. But for the experimental home recorder/writer and obsessive patcher and knob twiddler, this amp, at just $120, is an exciting no brainer.